From public to private, toddlers to high schooler’s, we compost with 20 schools & 8,890 students. 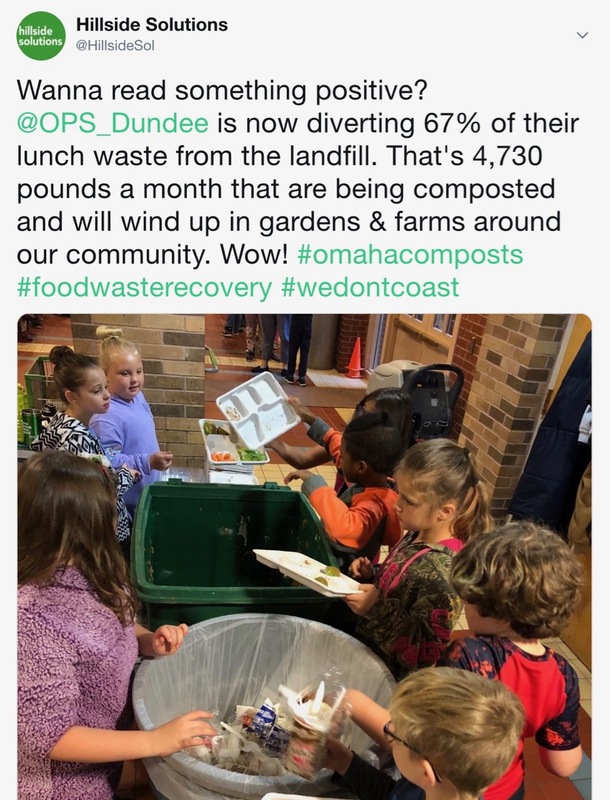 There’s a wave of sustainability sweeping through Omaha area schools, and you should join! — Read about what Omaha Public Schools' District Communications said. Composting transforms food waste into nutrient-dense soil which farmers & gardeners in our community use to grow trees, flowers, and food. As the area’s only commercial composting farm, we compost food waste, napkins, paper trays, along with yard waste and compostable service-ware. Use one-a-day: Since most schools just use our totes in the cafeteria, we suggest dedicating one clean/empty per day, which ensures you are never bringing old food back inside. After implementing with 16 schools, we can verifiably say our program works great! From toddlers to high schoolers, and with programs that launched in three months or as fast as 3 days, we’ve established the best practices to make your on boarding simple & easy. First step: Reach out to us to set up a meeting to go over the program. We’ll do the heavy lifting for you on figuring out how to set up the program. To help bring staff & students onboard, we’ll conduct an instructional presentation and assist in the cafeteria the first week. And the cherry on top: we’ll weigh everything & provide a report so you can show off your waste diversion data with the world! We have the area’s only commercial composting farm located in Ashland, Nebraska right next to the Wildlife Safari Park. Our farm goes by the name of Soil Dynamics. At this site, we turn it into clean, nutrient-dense soil that gardeners & farmers use throughout our community.